Does the Giant destroyer super gasser work in sandy conditions. Only thing showing is mound of sand. It is impossible to find the burrow in sandy condition. The tunnel closes behind the mole.It is even hard to find the opening. How does super gasser work. Do you have to close the hole after putting it in. How long will the gasser put out gas? 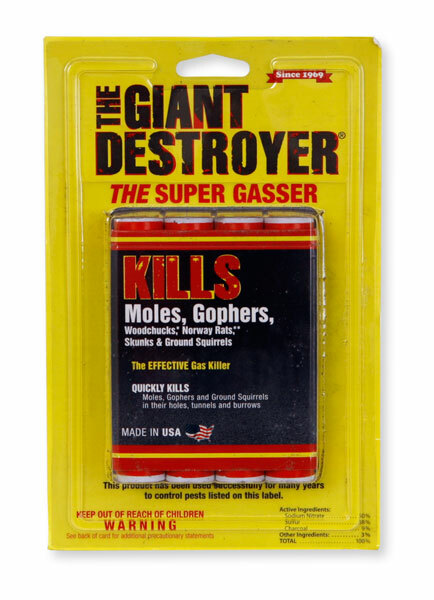 The Giant Destroyer is basically a smoke bomb that works 2 ways. 1 - it can kill the rodent if the rodent is trapped inside the tunnel and cannot get out. This is usually achieved by closing off any exits and making sure that the rodent only has 1 way out. 2 - it works by chasing the rodent out of the tunnel so that it can be killed. This is achieved by using some sort of technique such as a shotgun or a shovel. No kidding. In either case, it is imperative that the tunnels be open enough so that the gas has a way to seep through it. If the tunnel is closed off, then there is no place for the smoke to go but up and into the air.